Alice in Wonderland is not just any ordinary child fiction. This classic story is full of philosophy and truisms. The absurdity of the plot is enthralling, but the underlying message leaves a lasting impression. These famous Alice in Wonderland quotes throw light on important issues in a subtle way. At first, 'Alice in Wonderland quotes' sounds quite mundane. However, if you search carefully for inner meaning, you will find these quotes rich in truisms and life's great philosophies. These 7 Alice in Wonderland quotes explained help you get into the skin of the character with these quotes. 1. AliceThis line is the opening text of the story. Right off the bat, Lewis Carroll introduces Alice to his audience as a girl who had a highly imaginative mind, and a love for creativity. The reference of a book without "pictures and conversations" points to a little girl with a head full of ideas, and a heart for adventure. 2. RabbitLewis Carroll could have used an ordinary expression such as "Oh! My goodness" or "Oh dear!" However, by using an uncommon phrase such as "Oh my ears and whiskers!" Lewis Carroll coined a new phrase that caught the imagination of young and old alike. Also, he sets the tone for the rest of the story, where the White Rabbit, which to Alice's astonishment is one of the first animal characters she encounters that can speak. The speaking White Rabbit piques the curiosity of young readers who are now hooked on to the story. 3. AliceThis phrase is as legendary as the novel itself. The fact that Lewis Carroll uses an ungrammatical expression (the comparative degree of 'curious' should have been 'more curious') to facilitate his story creates a grand introduction to the plot. The term 'curiouser and curiouser' has now become popular in the English lexicon, alluding to a world of untold imagination, where normal rules don't apply. 4. AliceLewis Carroll had an uncanny way of bringing in deep questions in the middle of seemingly innocuous situations. Alice, who goes down a rabbit hole, gets acquainted with a strange world that lay buried beneath the ground. She finds everything about this world so bizarre, that she wonders whether she is dreaming. While pondering about the illogical turn of events, Alice also wonders about who she is and what is the purpose of her life. This contextually relevant, thought-provoking question urges the reader to also question his existence and how he relates to the world he lives in. 5. AliceIn the story, Alice faces a conundrum that makes her question her own sanity and wellbeing. She is so confused and befuddled, that she no longer trusts her own judgment and is unable to even talk about herself. 6. AliceAlice encounters a strange situation where the Duchess is nursing a baby which, for some reason resembles a pig. As the story unfolds, it turns out that the baby is actually a pig and it trots off quietly from the scene. Though on the face of it, this episode seems highly bizarre, Lewis Carroll points to deeply rigid social structures and the formalities that are accepted as good social behavior. The baby and pig metaphor points to our rigid views on what we find disgusting and cute. 7. The CatThe Cheshire Cat sums it all. 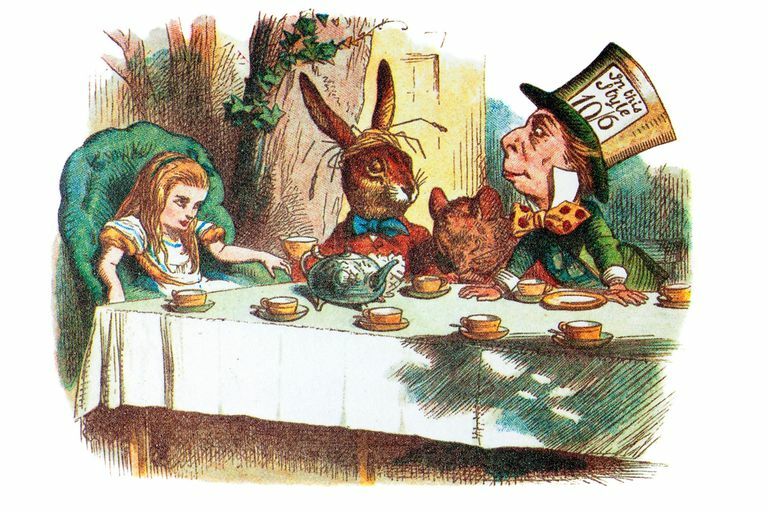 This is a statement that helps the reader to connect with Alice's feelings as she meets the strange characters in the rabbit hole. Here are 13 famous and bizarre quotes that make Alice in Wonderland a wonderful read. As you read these quotes, ponder on them with a philosophical point of view and find yourself staring at life's greatest mysteries.